New catalysts, which are of great importance to the chemicals and pharmaceuticals industries, should be developed in accordance with the framework of the planned “Asymmetric Heterogeneous Catalysed Hydration“ project. The in situ laser spectroscopy and anemometry in the visible spectrum range with high spatial and time resolution is well developed. Measurands are flow speeds, temperatures and concentrations of substances. However, the measurement of local concentrations and temperatures, particularly in liquids, is very difficult. High spatial resolution is important when it comes to catalyst solid bodies. Therefore the channels in the reactor metal sheet were measured at the beginning of the project using the optoNCDT 2401 confocal measuring system in order to enable a target/actual comparison to be made. The measuring system was also used to determine the flow distribution of the liquid by recording filling height measurements in the channels. The results showed that uneven distributions could partially occur in these chan- nels. 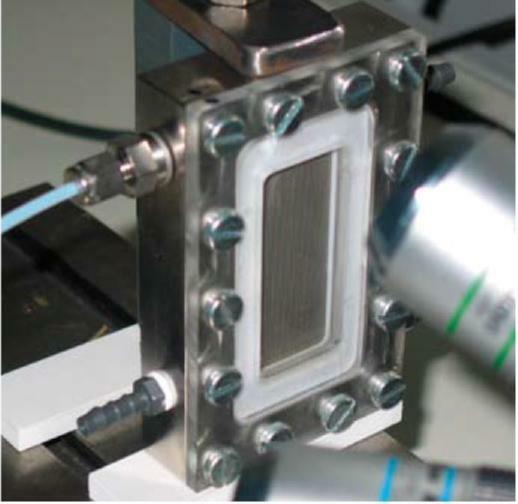 The confocal measuring system is mounted vertically in front of the catalyst. The beam of the sensor penetrates the 5mm thick glass pane and measures the depth of the micro channels after an air gap of 5mm. The channels themselves have a depth of around 200µm and a width of 400µm. Due to the compact beam path, narrow ca-vities can also be measured reliably using the confocal principle.